The American Anti-Vivisection Society (AAVS) is based in Pennsylvania and has been fighting against experimentation on animals since 1883. Humane Education has been an important part of their advocacy efforts since the late 19th century. The Miss B’Kind Animal Protection Club was started by the secretary of the AAVS, Nina Halvey, in 1927 and was an extension of the AAVS’s mission, but with a special focus on humane education. 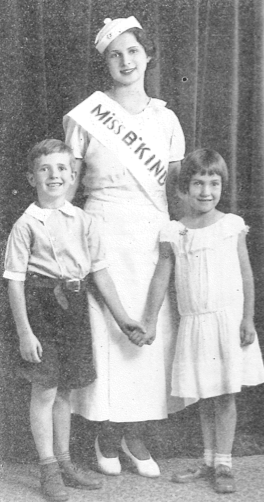 The Miss B’Kind Club’s motto was “I will be kind to animals now and when I grow up.” Halvey adopted the nickname “Miss B’Kind” when she gave lectures and addresses in the schools. Below is an ink blotter produced by the Miss B’Kind Animal Protection Club. Blotters were an inexpensive item for groups such as the AAVS to produce. They served a practical function in that they were a necessary part of writing with pen and ink until the invention of the ballpoint pen, but beyond that, they were a form of advertising and promotion. In this example, information about The Miss B’Kind Animal Protection Club was provided, including the address and contact information. The image on the left hand side of the blotter shows a water fountain where horses, dogs, and other animals could come and quench their thirst. These kinds of fountains became increasingly common in cities that had active animal advocacy groups and became part of the urban landscape in the early 20th century. The act of providing fresh drinking water for animals, of course, had very practical function, but it also stood as a very visible and public monument to the broader spirit of compassion for all species and, as such, is a particularly appropriate visual image to be included on this item. Miss B’Kind Club Blotter, c.1930s-1940s. Collection of National Museum of Animals & Society. At the top of the blotter is “MISS B’KIND’S WARNING,” cautioning against selling or giving a pet cat or dog to someone who would then turn around and use the animal for vivisection. Similar warnings were issued by other Anti-Vivisection groups, including the British Union for the Abolition of Vivisection. 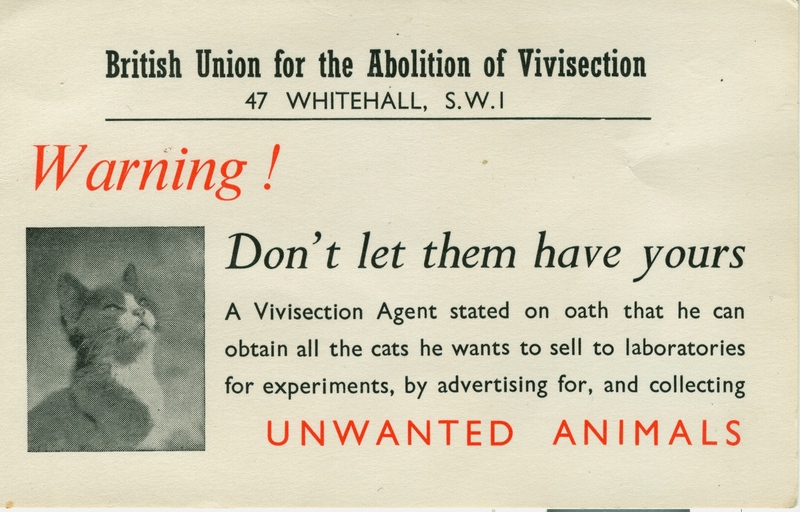 British Union for the Abolition of Vivisection postcard. Collection of Hilda Kean. The Miss B’Kind Club spread to other locations, including Hollywood, California where Frances X. Kadow and Pauline Hoffman formed one in conjunction with the Humane Education Club of Los Angeles. Pauline Hoffman (Miss B’Kind, Hollywood, California) poses with two young children. Photograph published in Our Dumb Animals, July 1934. Collection of MSPCA Angell.